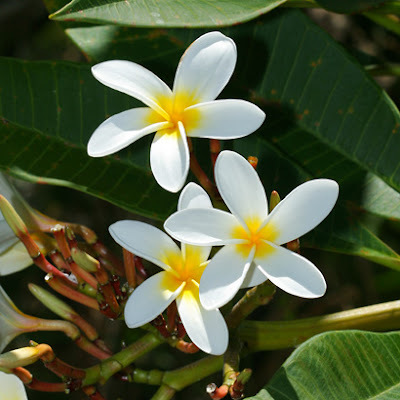 Other common names for this popular shrub include temple tree, nosegay, West Indian jasmine, and pagoda tree. Because it likes warm conditions and grows quite large, it is well suited to the greenhouse and is a rarity in the home. It is well worth growing, however, if the right conditions can be provided. The glory of the plant is the large clusters of heavily scented flowers carried at the ends of the branches in summer and fall. 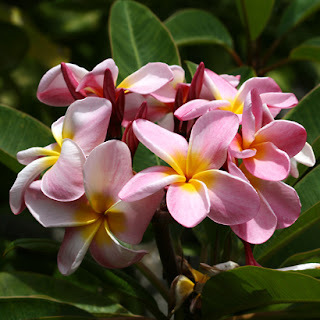 Each 2-in/5 -cm-wide flower comprises five thick overlapping petals, which are often pink but can be white, yellow, bronze, salmon, or red, invariably with yellow-stained centers. The pointed oval leaves can be as much as 12in/30cm long. HEIGHT: 10ft/3m in a container. REPOTTING: In spring, every second year. PROPAGATION: By stem cuttings in late spring. KEEPING PLANTS: Watch out for infestation by red spider mites, particularly in dry conditions. Warm temperatures, with a winter minimum of 55 F/13°C. Water well during the growing period and sparingly in winter. 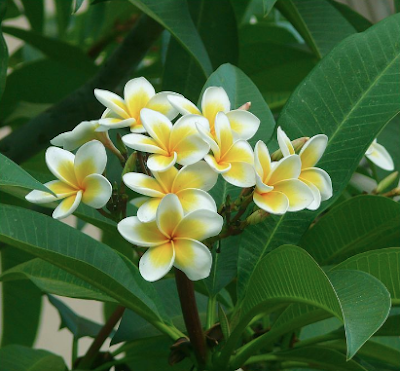 Feed every 2 weeks from spring to fall with a general houseplant fertilizer.